After a much better nights sleep we were up a ready to go for the day. The boat had sailed all night again but a glass of wine had helped with the rocking and noise. Not long after some cereal and eggs we had a dry landing onto Islas Plaza. On the shore we saw Swallow-tailed Gulls and their fluffy chicks but we had really come to sea Land Iguanas. So far we had seen Marine Iguanas all laying on the lava rocks on most islands but no Land Iguanas yet. We began walking and within a few hundred yards we saw our first. A mix of black and yellow and slightly bigger than their Marine cousins. They mainly sat under the cactus trees waiting for a prickly pear to fall and eat. Along the path we saw many of varying sizes and colours of yellow. The landscape was filled with yellow and red bushes and cactus trees. The iguanas blended in perfectly. 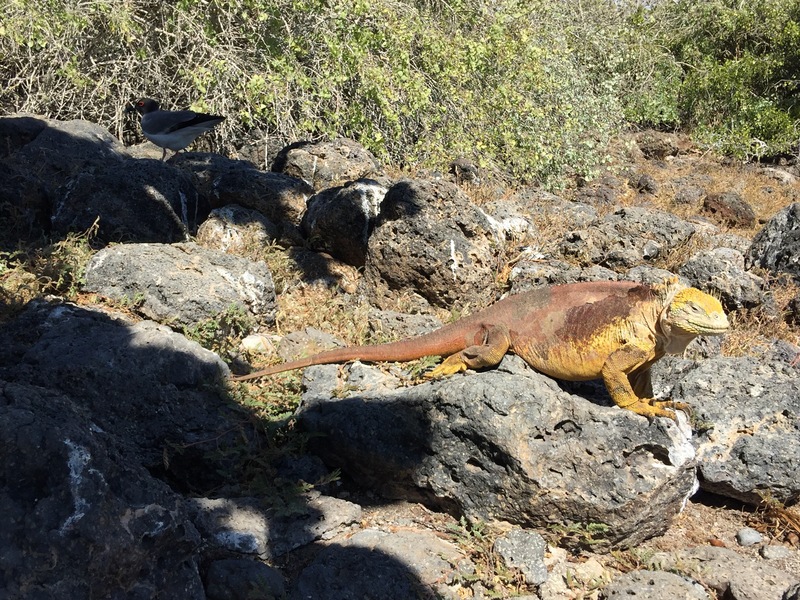 We continued walking up the path to the cliffs and past several more posing iguanas. At the end of path the smell changed and it was clear Sea Lions were about. All along the cliffs Sea Lions sat basking in the sunshine on the sheer drops. Remarkably they had climbed the 10-15m high cliffs on the rocks to the top. We sat and watched the waves crashing and taking pictures of the lazy beasts in the sun. A few Marine Iguanas also lay nearby enjoying the heat as well. Islas Plaza being the only island were you get two types of iguanas and as such a hybrid breed as well. Unfortunately these are rare and we didn’t see one today. After pictures on the cliffs we walked down to the shore passed more Land Iguanas and Sea Lion pups. The pups were very inquisitive and came right up to you, perfect for pictures! We passed a few iguana skeletons and departed the island. Back on board we motored for 2 hours towards Santa Fe Island. Once there we first had a spot of lunch and then departed for a wet landing on the island. Landing on the beach we had arrived in the middle of a colony of Sea Lions. 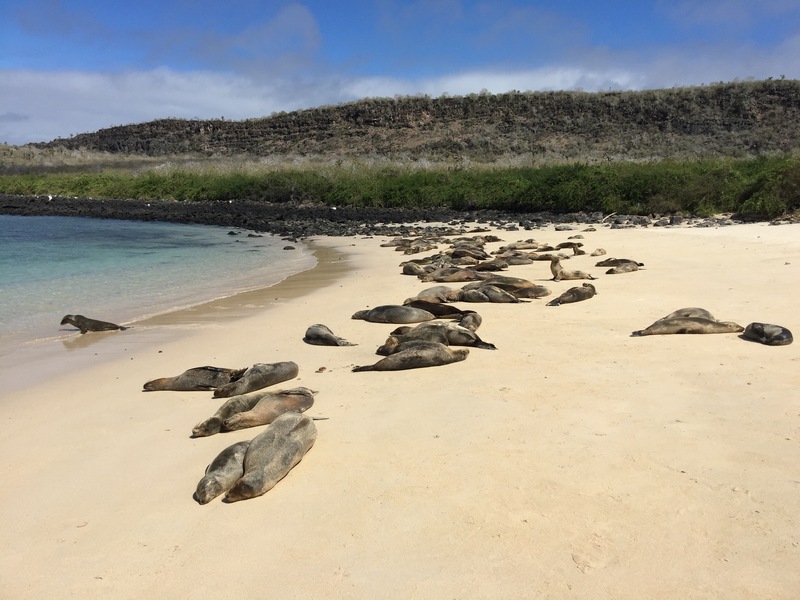 About 100 or so were lounging on the beach making their strange noises from barks to sounds that sounded like sheep. They didn’t car about us and let us pose for photos in the middle of their beach. They could be seen popping in and out of the water and laying all over each other. 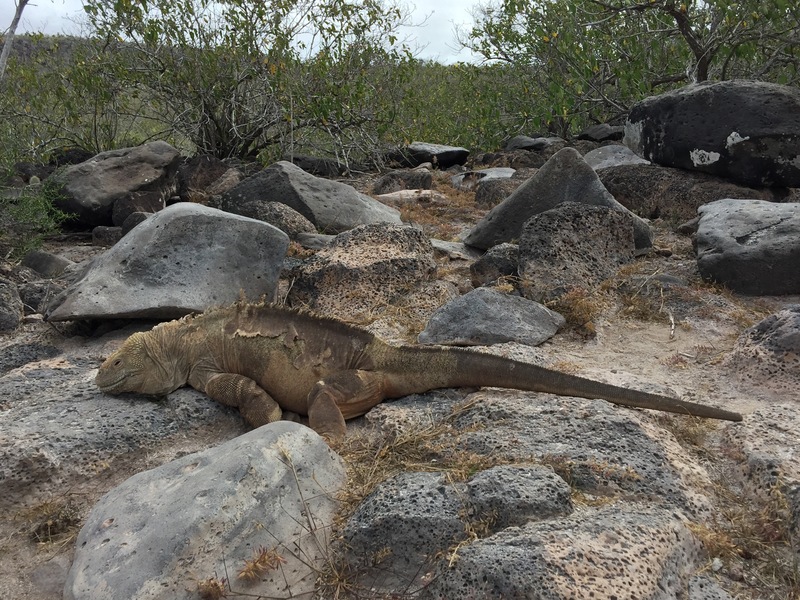 We began walking through the island and our hope here was to see a second type of Land Iguana. It wasn’t long until we found some. These were more beige than their yellow cousins this morning and much bigger- especially the males. However they were much more wary of humans than the others. Possibly because of the hawks circling above or that our guide explained it is hard to get permits for the island so they don’t see too many people. Either way we had to be quite and quick with our photos. On our walk we saw several large males and females and one pregnant one. These had adapted and evolved bigger to reach the cactus plants which had grown taller. 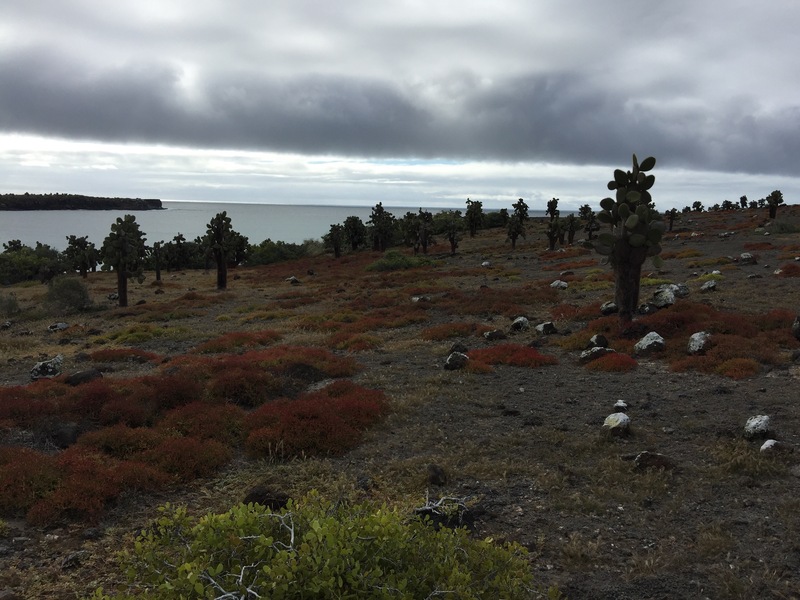 Many of the cactus trees on the island were 300 years old and massive. We made our way down to another beach and were picked up by the ribs. We had a quick turnaround onboard and got ready for some snorkelling. Snorkelling along the natural harbour wall we saw many types of fish, including some very large box pufferfish. It wasn’t long until we spotted our first White Tip Reef Shark. Laying on the bottom about 4-5m down and about 1.5m long. Another 100 metres along was another but bigger at about 2m. We carried on swimming and crossed to the middle of the bay where we saw a few stingrays and then someone called out their were more sharks. This time right in the shallows in about 1m of water 5 all sat, all between 1.5 and 2m long. 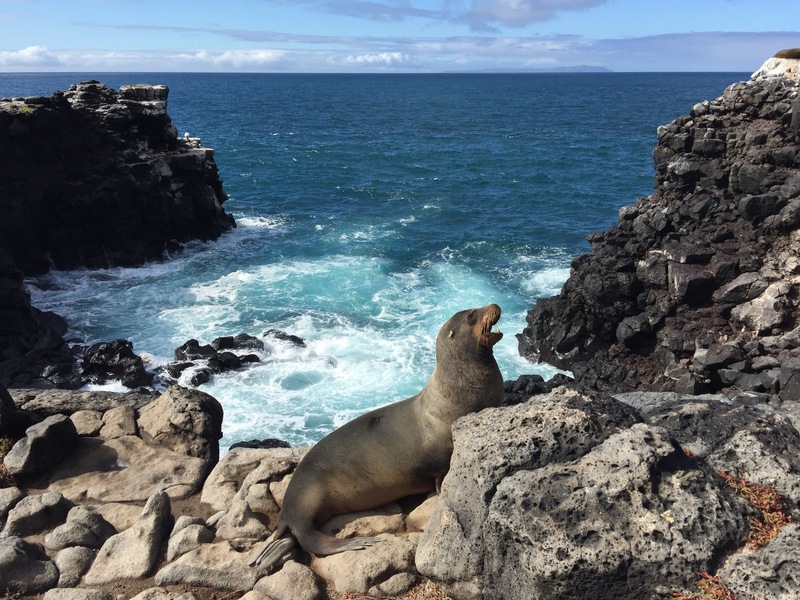 Some swam around us and several sea lions also swam among them and us in the water. Being so shallow the water quickly got murky with everyones fins and soon it was hard to spot them coming in behind you. Slightly nerved we moved on and swam more to the middle of the bay. Here several turtles were swimming gracefully through the water. We followed a few and even one Eagle Ray through the water. A fantastic snorkel (the best of the trip) we boarded the rib. A few others were still swimming and from the boat we could see the sharks clearly. They swam underneath and around as the rest of the group got back in the boat. We zoomed back to Estrella but on the way Renie spotted a school of Eagle Rays. We stopped, through on a mask and dived in. About fifteen Eagle Rays were gliding through the water and we swam with them. They had a distinct shape quite different to the stingrays as they flew through the water like they were beating wings. An amazing spot and a perfect end for a great snorkel. We had seen more than most dives. Back on board we had our final night, cocktails with the crew, dinner and packing! The Estrella harboured in Puerto Ayora so we weren’t motoring all night but despite this we didn’t sleep well. We were up at 5am for breakfast and the crew took our bags to land; we got to shore around 6am and drove across the island to the highlands. 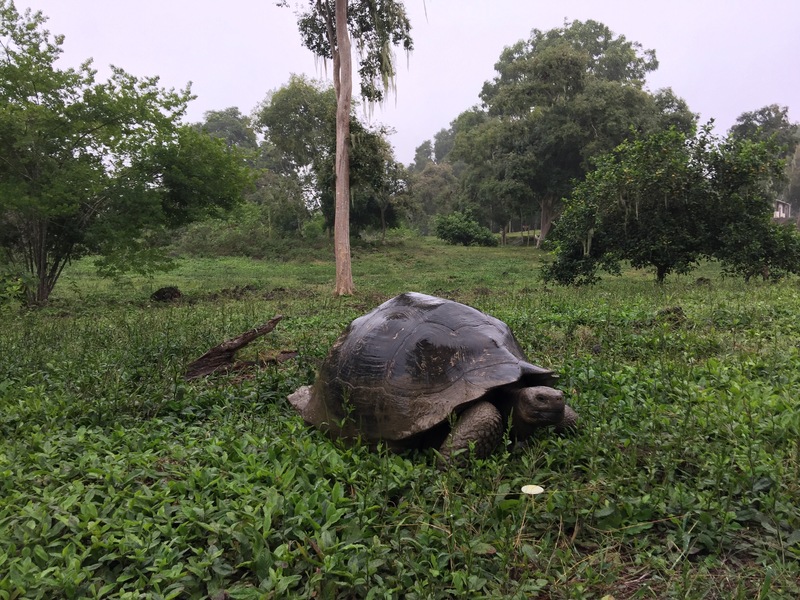 Here we stopped at the El Chato Reserve to see Giant Tortoises in the wild. The tortoises are free to leave the reserve as they wish so are ‘technically wild’. 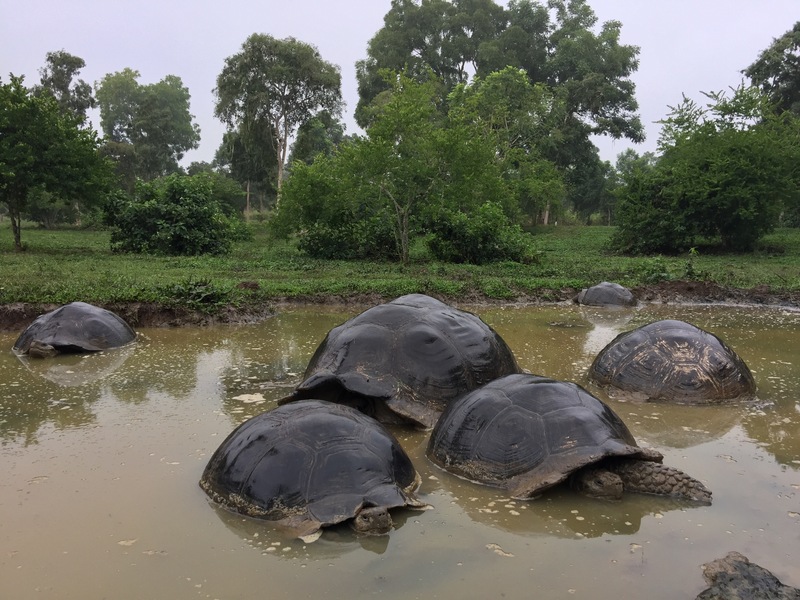 Walking around in the rain and with wellies on it wasn’t long until we found out first Giant Tortoise, enjoying a nice muddy puddle. Several others were nearby in the undergrowth or in the nearby lagoon. Here they sat in the water in groups and when next to each other it was clear how much bigger the males where compared to the females. They weren’t too keen on visitors and retracted their heads back into their shells, with a big intake of breathe that sound like their shell depressing. Mostly they sat in the water, starting at us not moving. We explored other areas of the reserve and found more tortoises. One male was huge sat in a pond and must of been well over 100 years old. They are capable of living to over 200 years. Trudging around in the wet we took lots of photos of them in the grass and undergrowth. None however wanted to extend their neck for the classic shot. 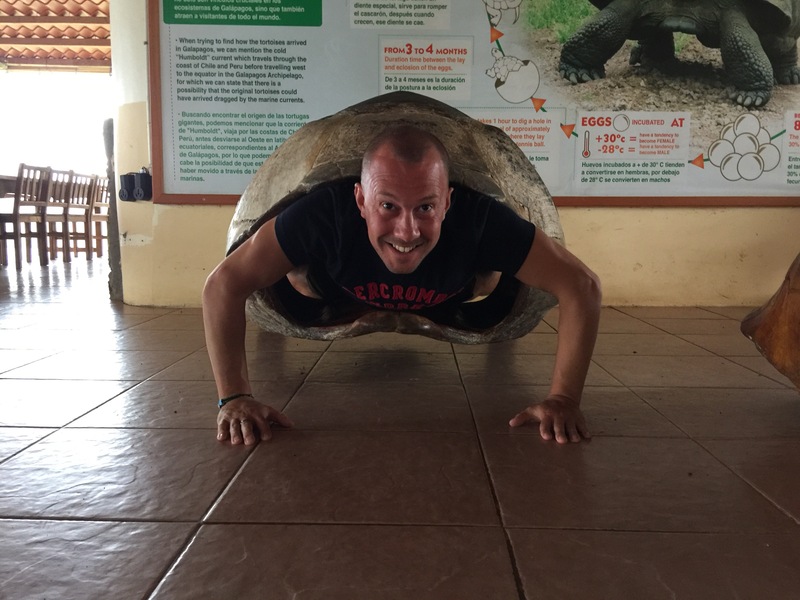 We dried off and in the welcome centre for the reserve they had an empty Giant Tortoise Shell you could get in. Everyone crawled into the massive shell and pretended to be a tortoise. It was surprisingly heavy and awkward.